Do you share your life with a jumper? Do you find yourself late to the office due to snagged skirts or paw-printed muddy pants? Do friends shy away from visiting for fear of being knocked over? Read more about how to teach your dog to stop jumping. A simple, common-sense approach and lots of patience usually will prevent dogs from jumping. Typically, dogs jump to get attention. When your dog jumps on you, your reaction is probably to either yell at him for jumping or push him away. The result is that you may be encouraging him to jump! After all, you’re touching him when you push him down or talking to him when you yell, and that‘s all he really wants, a little attention from you, and negative attention is better than no attention at all. 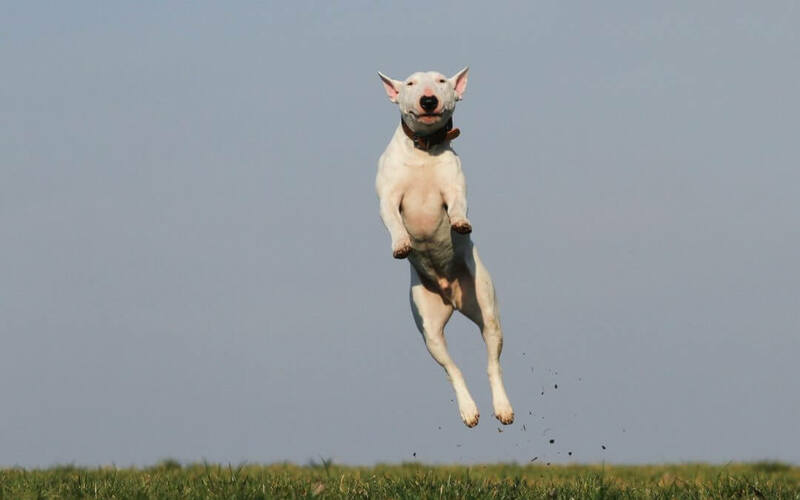 The “jumping for attention” pattern has probably worked for your dog since he was a puppy. What people considered cute as a puppy is now a problem because your dog is bigger and stronger. Dogs are actually very good trainers of people. You can, however, reverse the trend and retrain your dog not to jump on people. The goal in training your dog not to jump is to prevent him from jumping in the first place. So, if you don’t want your dog to jump, what would you rather he do instead? How about a nice “sit”? If your dog does not already know “sit,” practice the basics until he sits on every command. Ask him to sit by putting a treat in front of his nose and moving it directly back in an invisible line toward his tail. When your dog rocks back into a sit, praise him and give the treat. If you ask your dog to sit and he decides not to, he gets no praise and no food treat. You’ll be surprised at how quickly your dog catches on. When he sits every time you ask him, start mixing up the rewards. Sometimes give food treats and sometimes give a pat on the head, or a brief game of fetch with a favorite toy. He is now earning your attention by sitting, not jumping. The next step is to expect him to sit a little longer each time before getting the treat or attention. Start with short intervals, first about 3 seconds, then 5, then 10. If he gets up too quickly, do not give him food or attention. Before long, he should be able to sit for a full minute or two. The next step is a little tougher. Your dog now knows that sitting gets the reward he’s after. But he still has to learn that jumping no longer works. Be prepared – this does not happen overnight but it does work. Whenever your dog jumps he must be totally and completely ignored – no angry words, no pushes, no pats, not even eye contact. Make sure your family understands the rules and put on your old blue jeans. This will undoubtedly be a challenge for everyone. Your dog will jump for attention. When he is ignored, he will quite possibly jump even higher. And when that does not work, he may jump even higher, clawing and barking. This behavior is normal and a part of your dog’s learning process. He must learn that no matter how high he jumps, he will always be ignored. Only then will he settle down enough so that you can tell him to sit. Once he sits, give him much praise and petting. Then keep a close watch on him. Before he so much as crouches to jump, give the “sit” command. When he sits, reward him again with lavish praise and attention. Any time he tries to get up from the sit, straighten up, turn your back and give him the cold shoulder. It may take some time, but he will soon learn that to avoid being ignored and to get the attention he wants, sitting is the only answer. Everyone in the household must stick to the rules and be consistent. You can try it first with family members. Go outside, ring the door bell and come in like a guest. Ask your dog to sit. If he refuses or gets up, “the guest” goes back outside. Uh oh, no attention for the dog. Soon, he will learn that if he stays seated, the “guest” not only comes into the house, but also pets him! After your family finishes playing “guest,” invite a neighbor over, explain the rules and give it a try. Don’t be surprised if your dog tries to jump a couple of times. After all, this is someone new. Soon he will learn the rules are the same for everybody. The result should be a dog that sits at the door when he hears the doorbell, and runs at you full-tilt in the evening to say hello, only to screech to a halt and sit at your feet. For more information about pet behavior and training, please visit our behavior section.